1979-1981 radio faceplate. Aren't they all the same? Topic: 1979-1981 radio faceplate. Aren't they all the same? Hello all. I have a 1979 Trans-Am with an uncut factory radio faceplate and aftermarket radio. I want to put an original era radio back in the car. I find that a 1979 Bonneville am/fm stereo and a 1980 Trans-Am am/fm 8-track have face / dial area too large to fit my radio face plate. My opening is 4.25 x 2". These radios are 4.5 x 2.5. I don't get it ! Any insight ? Re: 1979-1981 radio faceplate. Aren't they all the same? The smaller size opening is correct for 78-81 Firebirds. 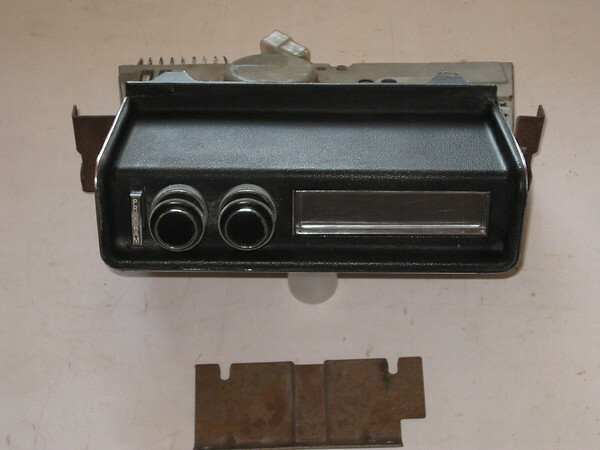 Some larger cars used a larger radio, and the larger 8-track in a Firebird was mounted in the console map pocket. Bezels for them are hard to find. There was a combined radio that also had 8-track built in but were smaller. Assume you have the other. This is the console type. Is this what you have or the FM radio type? Are you sure it actually came out of a Firebird or just advertised?